The Petersburg Metro. СС-BY-SA-2.0: sbamueller / Flickr. Some rights reserved.Dozens of casualties, an unprecedented collapse of the city’s public transport system and arrests of people of “non-Slavic appearance” — these are the obvious consequences of the Petersburg metro attack on 3 April. But the solidarity and readiness to help which Petersburgers demonstrated during and after the attack reminded many of them that our lives and fates are in our own hands. Indeed, locals did not succumb to panic, and have continued their open criticism of the authorities’ actions after the attack — they’ve even continued to hold protests and refused to put up with pressure from above. For the authorities, this is an unpleasant reminder that our citizens are capable of determining their own lives without them. Whether this independent feeling will grow into a rallying cry will become clear soon enough. “As soon as I recall it, I start shaking. When I read a list of the casualties online, I burst out crying, I couldn’t stop,” Natalia Kirillova, a photographer and former TV director, tells me. Natalia was unfortunate enough to be travelling in the same metro carriage as the bomb on 3 April. Natalia made her way out of the crumpled carriage on her own. Upon making it to the surface, the doctors diagnosed her with concussion and sent her to a hospital. She was confined to a hospital bed for two weeks — and spent the same amount of time at the Beliye Nochi sanatorium after. Natalia’s at home now, but is still under a therapist’s care — she sleeps only intermittently, and her heart hurts. 4 April: Petersburgers pay respects to those who died at Technological Institute metro station. Photograph courtesy of the author. Fourteen people were killed in the explosion on the St Petersburg metro, including the attacker. Later on, two more passed away in hospital. Overall, nearly 100 people requested medical assistance, and around 50 ended up in hospital. Now, one month later, over 20 people are still in hospital. Neither Natalya Kirillova, nor the other survivors of the explosion, have yet received their promised compensation. They must still undergo a forensic medical examination and fill out reams of documents. In the best scenario, Natalia will receive her compensation payment at the end of May. For now, she’s being supported her friends, acquaintances and colleagues. They bring her medicine and have even brought her a new camera, to replace the one which was damaged during the explosion. Nadezhda Sosedova, a psychologist and psychoanalyst, was also traveling in the metro carriage on 3 April. She, however, was sat in a corner far from the centre of the explosion. Nadezhda was hit by the blast wave, and held on tight to the rail — as a result, she survived with just a bad bruise on the leg. Her hair caught fire from the heat, but she quickly managed to put it out. When she finally climbed out through the broken windows on the wagon’s doors, she looked back and saw the mutilated, charred bodies of a dozen people. Reflecting on her own luck, Nadezhda simply says that “the Almighty clearly had other plans for me.” Although Nadezhda herself, a specialist on psychological traumas, has also had to take a course of group and individual therapy. But therapy alone wasn’t enough. After three weeks, she took time off work and left for India, to recover in full. As we spoke over Skype, I could hear the lapping of ocean waves from an open window behind her back. 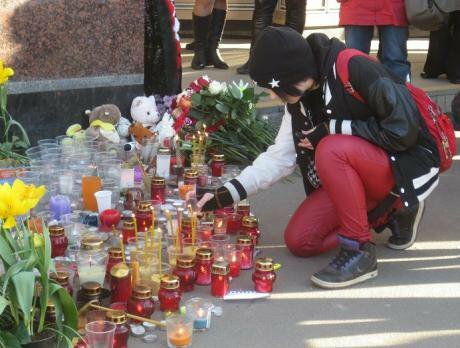 Much ink has been spilt about how the tragedy on the Petersburg metro brought people together. Publications discussed how locals invited complete strangers home, offering them coffee and pancakes. During the day of 3 April, Aleksandra Krylenkova, an activist and human rights defender, heard about the explosion on the metro. Her first thought was simply that there was going to be chaos on the city’s public transport. Like many in the city that day, psychiatrist Maria Berlin faced a journey home of several hours. Like many, she was saved from such a fate by the volunteer drivers — after which, she decided to chip in herself. In a post online, Maria offered free psychiatric support to anybody suffering extreme stress and panic as a result of the day’s events. Maria circulated announcements about her offer of help until the end of April, although she knew in advance that she’d have to deal with a lot of respondents. Petersburg residents survived the transport collapse, albeit with some difficulty, and it was quickly resolved — metro services were resumed towards the evening of 3 April. The most visible manifestation that something was amiss were the newly-working metal detector units set up at metro stations. They had been installed a few years ago, but stayed “silent” until the bomb attack. When Petersburgers entered the metro in the days following the tragedy, they were met by a cacophony of beeps, whirrs and whistles. Until then, the metal detectors had worked in silence across the metro system — according to its employees, because nearly two million people use the service daily, and searching them one by one would prove very difficult indeed. An inspection of the metro was immediately carried out by the city prosecutor, Investigative Committee and Russia’s transport watchdog, paying particular attention to its safety and security systems. After a couple of days, when the inspection had concluded, it became known that a whole range of violations had been discovered, which were reported to the metro administration. High-level meetings to discuss the results of this inspection will only be held in the middle of this month. But Russia’s investigative committee has already opened a criminal case against one employee of the metro system, Konstantin Ippolitov, who has been accused of negligence. 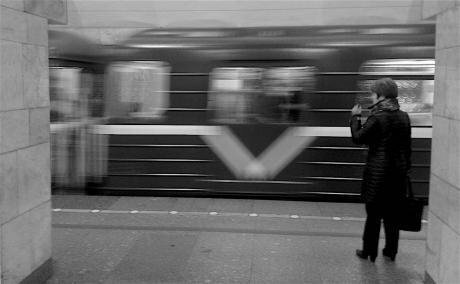 Due to an inconsistency in official instructions, the suspected bomber Akbardzhon Dzhalilov entered the Akademicheskaya metro station on Ippolitov’s watch. 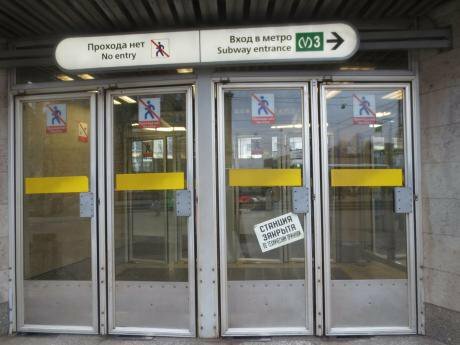 Although security cameras clearly show that Dzhalilov simply waited until none of the metro employees were near the turnstile (there were three of them that day, and the metal detectors were working in silent mode), the blame for this “negligence” fell squarely on Ippolitov. “In my opinion, they just found a switchman, a fall guy,” says Viktor Tereshkin, a journalist and ecological activist who witnessed the explosion on the metro. Viktor worked as a fireman for many years, and immediately understood that a blast had occurred — rather than a fire, as some believed. When it came to identifying the perpetrators of the attack and their accomplices, Russia’s Investigative Committee and FSB showed an enviable activity, dedication and energy. Just two days after the explosion, the parents of 22-year old Akbarzhon Dzhalilov, a native of the city of Osh in Kyrgyzstan, were called in for questioning. The remains of Dzhalilov, the primary suspect, were discovered at the centre of the blast in the metro carriage, together with the remnants of a detonated explosive device. Arrests of potential suspects continued throughout April. 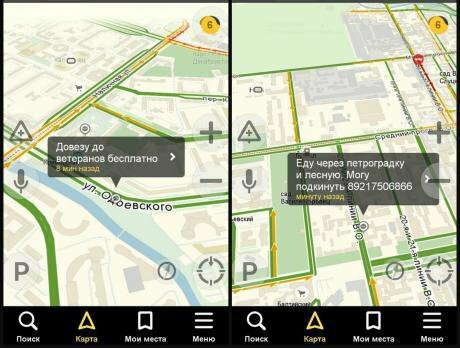 In the first days of the investigation — from 5 to 7 April — some 14 people were detained. 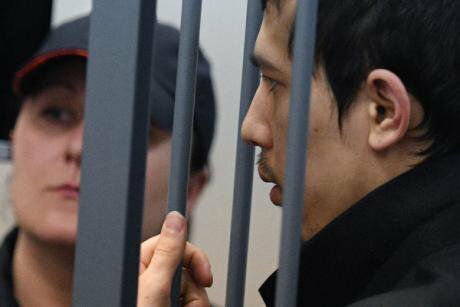 Another native of Kyrgyzstan, Abror Azimov, was then detained in the Moscow region. A video recording of his dramatic arrest in a forest was broadcast on all television channels, although Azimov’s parents declared that their son was abducted from hospital and that the video was staged. Shortly after, Abror’s brother Akram was detained. At the end of the month, FSB director Aleksandr Bortnikov declared that his agency had identified the person who ordered the terrorist attack, but would not disclose the name, nor the names of those in whose interests the attack was carried out. Arbor Azimov, the suspected organiser of the Petersburg metro attack. (c) Ramil Sitdikov / RIA Novosti. All rights reserved.However, the flurry of activity by FSB investigators also raises several questions. A month on, several of the men arrested (who are in pre-trial detention in St Petersburg) say that they still haven’t been officially charged. Makhamadyusuf Mirzaalimov declared as much through his lawyer. In his words, he moved into a new flat, which was stormed just five days later by the FSB, who promptly arrested him. Mirzaalimov took issue with both the content of the Investigative Committee’s accusations and the nature of his arrest. Despite protest from his lawyer Samvel Sarkisyan, Mirzaalimov has been detained until 2 June. At the time of writing, there are 20 cases pending against people suspected of involvement in the explosion. They’re accused not only of preparing a terrorist attack, but also aiding terrorist organisations and acting as recruiters for ISIS. What are they actually guilty of? Petersburgers may never find out. For nearly three weeks after the explosion, it seemed as though the law enforcement agencies and security services were wholly dedicated to investigating the causes of the terrorist attack on the metro, searching for its perpetrators and organisers — that is, carrying out their duties to ensure safety and security in the city and across the country. But when on 29 April, a new mass protest was held in St Petersburg (“Nadoel!”) and several other cities across Russia, their attitude suddenly changed. It was obvious; catching the perpetrators of the attack was just a “warm-up” before going back to their primary duty — protecting the authorities from the indignation of Russian citizens. 29 April: Elena Osipova at the "Nadoel" action. Image: Elena Osipova.Practically everywhere else, the day passed without mass detentions — but St Petersburg was quite an exception, and the authorities made an example of local activists. Nearly 150 local people approached the office of the presidential representative’s building on Petrovskaya embankment, brandishing letters addressed to Vladimir Putin. Some 120 of them were detained, taken to police stations, and even hauled up before courts. Several of these trials, which are now continuing, have already reached a verdict — Dinar Idrisov has been ordered to pay a fine of 1,000 roubles (£13). In any case, the connection between the terrorist attack on the metro and the aggression shown by the authorities towards the Nadoel protesters does not seem too obvious to participants of the latter. “Sure, the attack has led to a stricter security regime in the metro. But the harsh reaction to Nadoel seemed more like a desire to get even with oppositionists for 26 March, when the authorities couldn’t prevent the mass protests in Moscow, St Petersburg, and other cities,” believes Andrei Pivovarov, leader of the St Petersburg branch of Open Russia. Evgenia Litvinova, a member of the political council of the St Petersburg branch of the Parnas party who was detained on 29 April, believes that the authorities had begun to tighten the screws in late March. As Evgenia Litvinova puts it, in police station number 33, where she and a few others were brought after being detained at the Gorkovskaya metro station, the police officers were in a bind. None of them knew what to do; they had no experience of “working” with participants of mass protests. Therefore, the detainees heard no lectures in the spirit of “we’re fighting terrorism on your behalf, while you go out there and cause a scene.” In the words of those arrested, the police didn’t even know how to fill in their paperwork (Litvinova’s had to be re-drafted four times). Nevertheless, in her opinion, the authorities’ plan — to show that they had gone to Syria to fight international terrorism, possibly with some success — had crashed and burned. “Now terrorism has come to St Petersburg. 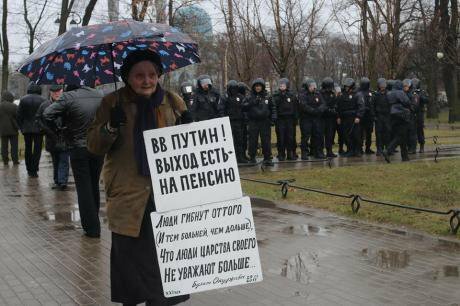 Somebody has to pay for that, so they start catching and harassing peaceful civilians,” Evgenia believes. Dinar Idrisov believes that there certainly is a connection between the terrorist attack on the St Petersburg metro and the aggression shown by the law enforcement agencies to activists in the city. 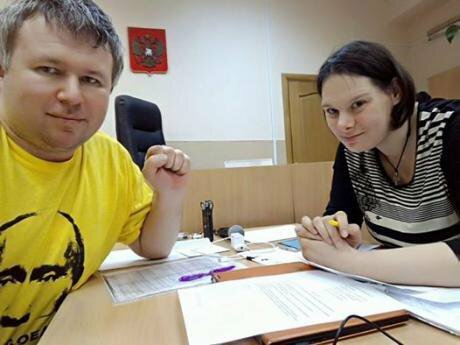 Dinar Idrisov and Ksenia Mikhailova at Petersburg's Police Station 22 after 29 April action. Source: OVD-Info.Looking forward towards 2018, when presidential elections will be held in Russia, we can only expect an intensification of pressure on the opposition. And it will soon become clear precisely which justifications will be concocted to limit civic protests in the form of completely harmless walks by protesters through city streets. The opposition is already gearing up for protests on 12 June, as Alexei Navalny called for in mid-April. This wholly unexpected wave of youth protest which arose on 26 March has given the authorities an obvious cause for concern — and it’ll be hard to stop their habitual crackdown on dissent, even if articulated under the banner of “fighting terrorism”. According to Dinar Idrisov, his posts are now “liked” and shared by ten times more people than six months ago. He receives many more responses to his live broadcasts from Russia’s courtrooms. And that, in his opinion, is testament to the fact that the authorities’ age-old strategy of “pressing them until they give up” has simply ceased to work. In fact, Like in a zugzwang in a game of chess, it’s probably having exactly the opposite result; the more the authorities pressurise ordinary citizens, the more likely every subsequent move will only weaken their position.